Tom Boyd’s ability to become as proficient in the ruck as he is up forward has him primed to continue is improvement as an AFL footballer next season. That’s the view of Bulldogs’ assistant coach Ash Hansen, himself a premiership forward in his playing days for West Coast. Boyd is just 23 years of age, and has 61 games to his name. 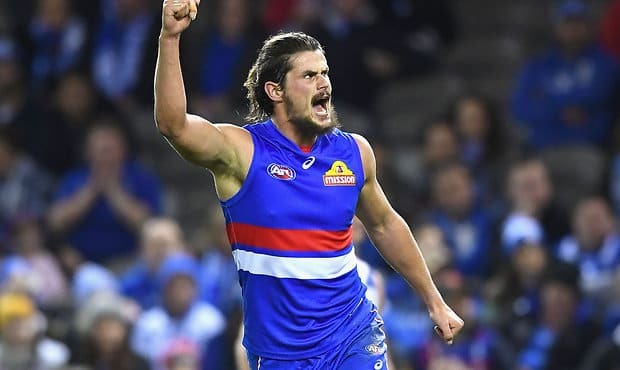 “We know he’s got a high level of talent and we’ve seen what his best looks like,” Hansen told westernbulldogs.com.au. “I know Tom is striving to get there as soon as he can, and with consistency, and we really encourage him to do that. Boyd played 12 games in 2018, and although he missed the last five matches of the season with a back issue, it was a solid return to football. “Tom really started to develop his ruck craft this year. He probably played more ruck time this year than he has previously, and it grew over the course of the season,” said Hansen. “Before he injured his back later in the year, I thought he really started to get some nice continuity in his performances. He was available for training, available for games and strung a lot of performances together after an injury interrupted pre-season. Standing at 200cm, Boyd has great agility and adaptability. “He’s certainly still an aerial threat. His strength around the contest started to improve and his ruck specific fitness grew as well,” Hansen said. “Availability of personnel usually determines whether he plays forward or ruck from week to week. It’s a great position to be in where we know he can play both roles, and then we can select that team on balance or where we think we can get an advantage against the opposition. “The ruck is one of those positions where the more time you spend in that area of the ground, the more confident you feel, the craftier you get and the more dominant you can become. “I think it’s a time-based thing, which is the same for our young, tall forwards. The more time he spends on the ground, the more time he spends training, we’re going to start to see his underlying strengths as he starts to blossom. Hansen said Boyd’s goals for 2019 are simple. “He’s such an aerial threat, if he can win ground level possessions, win those loose ball gets, that will certainly help him increase his involvement. I like how we are giving him two roles to learn at the same time. Why get one role right to a great degree, when you can learn two at a slower rate and risk complicating his mind and game. That said, my faith in him to achieve his enormous potential dispite this remains unchanged. Availability of personnel usually determines whether he plays forward or ruck from week to week. Our rucks have been poor this year, forcing the coach to play Tom in that role. I have no doubt, if English can fulfill his potential, we will see less of Boyd in the ruck. My memory is that most weeks we didn't have all of Roughead & Campbell & English & Trengove injured/suspended. That aside, English and Boyd are rare talents, and if you can better manage their health and those around them, then they will reach their potential and the team will be a lot more competitive. I won't be convinced we've managed his development as a player as well as it should, but that's the past and from 2019 onwards hopefully they will. Watched the GF again the other day and still can’t fathom why he wasn’t the Norm Smith. He was colossus. Hopefully he can reach those heights again particularly in our forward line. Yep. I watched it not long ago, and still can't figure out Johno and the other judges talking about JJ's metres gained. Nothing against JJ that day, but a lot of those long kicks were not overly effective. It's just not a great stat to hang a Norm Smith on. Shots at goal (5), goals (3), contested marks (26) and involvements in key plays are a far greater impact although the stats might not look as high. But when you just watch the game, when you just look out for who is making the most impact, most of the time. Tom was clearly our best. I wonder sometimes after watching the DVD, whether the noise around his contract impacted some of the voters opinions. Play him forward. Stop compromising him because of our crap ruck stocks. How about we recruit some good rucks? (Apart from Tim who will be a gun in 4 years). Yeah we got Tom for that reason. I'm hoping he can take some more marks up there next season and kick goals. Has had to deal with some personal issues and injury. It still pays to have tall forwards who are strong aerially as we saw in the Grand Final yesterday. Need to have a strong ruck and Tim English is the future but still very young. Sounds really good ledge. We would scare a lot of opposition defences. If we don't improve the delivery bit, or Boyd's marking, we're going to continue to please a lot of defences too. Looking at Mason Cox. Boyd could do worse than imitate his ability to lead at the ball carrier, take the mark out in front to eliminate the opposition's chance to spoil.